Dr. Goebbels, Reichsminister für Volksaufklärung und Propaganda (Reich Minister of Public Enlightenment and Propaganda), visiting Lauban shortly after the liberation with the camera crews of the Wochenschau. Here he is seen congratulating the 16-year-old Willi Hübner. As casualties mounted during the Second World War, Germany was forced to call up ever younger conscripts to fill the ranks of the Wehrmacht. So dire was the situation at the end of 1944, that boys born in 1928 were called up to serve the Fatherland. They were 15 or 16 years old and had grown up in the shadow of Nazism. Each would have spent their teenage years in the Hitlerjugend (Hitler Youth) preparing them for military service. The net result of this was a cadre of youths that grew up surrounded by Nazi propaganda and were called up to serve the Vaterland they had been raised and trained to defend. In many cases they fought bravely against overwhelming odds, but the lives of thousands of these youths were wasted by throwing them senselessly into battle with the Allies when the war was already lost. 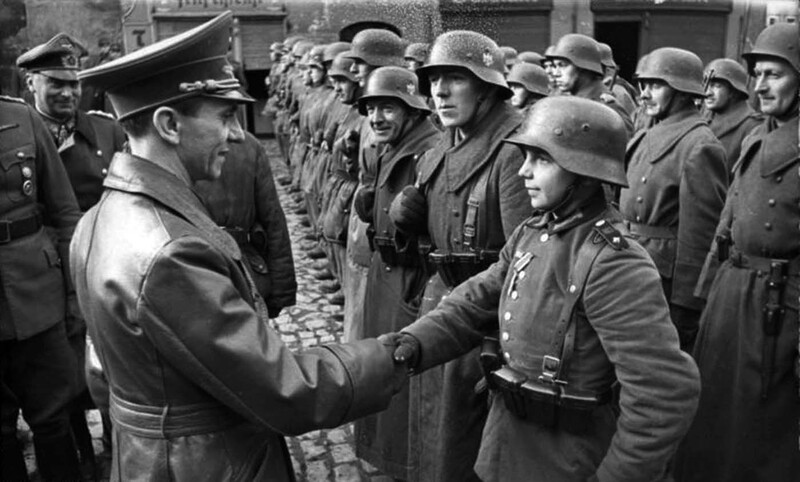 One of these young soldiers was Willi Hübner, a 16-year-old messenger with the Führer Grenadier Division. At the beginning of March 1945 the Führer Grenadier Division was part of a counterattack to retake the Silesian town of Lauban. After 8 days of fierce fighting the town was secured, and cameras from Die Deutche Wochenschau were there to capitalise on this success for propaganda purposes. 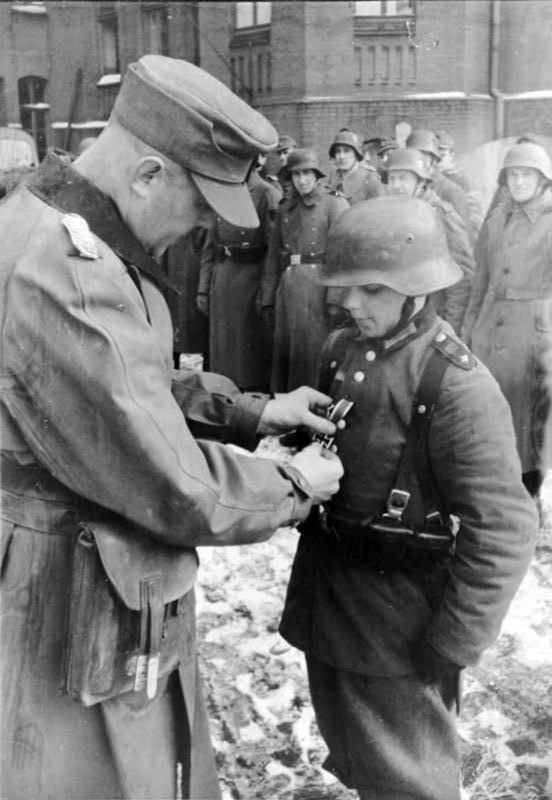 Hübner was first awarded Eisernes Kreuz 2 Klasse (Iron Cross 2nd Class) by Reich Minister of Propaganda Joseph P. Goebbels in Lauban. At 16, he was one of the youngest recipients of the award. Artur Axmann, leader (Reichsjugendführer) of the Hitler Youth (Hitlerjugend), redecorating Willi Hübner. One day after he was flown to Berlin, given a new uniform, redecorated by Artur Axmann, and was told to wait to meet Hitler. On 20th March 1945 there was an award ceremony in the gardens of the Reichskanzlei in Berlin for members of the Hitlerjugend who had distinguished themselves in combat. The footage from this event is very famous, as is the last known footage of Hitler to be recorded. Willi Hübner was compelled to tell his story for the cameras: “When the Russians were closing in on Lauban, I reported for voluntary duty as a messenger to the combat commander. My job was to take dispatches to the individual command posts. I also frequently took provisions and panzerfausts (literally “tank fists” a disposable anti-tank weapon) up to the front line under fire. I carried the panzerfausts in a wheel barrow under enemy fire”. The video below shows Willi telling his story (at 01:23). Adolf Hitler touches the face of Wilhelm “Willi” Hübner during an awards ceremony behind the Reich Chancellery on March 20, 1945. 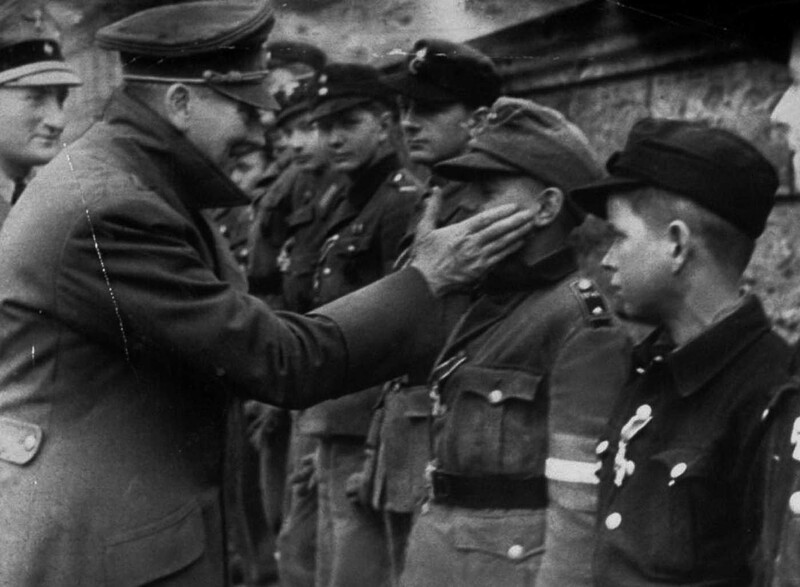 While they waited for Hitler, Axmann told them to be at ease and to not greet the Führer with the Nazi salute. Willi Hübner (1929-April 12, 2010) survived the war and settled in Landshut, Bavaria, becoming a good engine mechanic. He was interviewed for several documentaries including ‘V Was for Victory’ and ‘The World at War’. War is always the cruelest on the young. It snatches away the most precious trait they possess. Innocence. One of the youngest recipients of the Iron Cross? You mean they had recipients who were even younger? If the war had dragged on for any longer, they would have been pressing guns into the hands of kindergarten children. As for Willi, he looked more like he was 12 than his 16 years. I always held firm in the belief that this photo op was staged due to having found simebody shorter than Goebbels for once. It's disheartening that thousands of German child soldiers were sent to their deaths by the desperate Nazi Regime to fight a war the regime had already lost. This is supposedly a film taken in the reich chancellery gardens around April 1945, the glass is still in the windows and there are no bomb craters to be seen anywhere, despite the redarmys heavy shelling of the area . This film was surely staged at an earlier date . I suggest it is probably General Schoener decorating Willi, not Axmann whose face and uniform is entirely different - as you can see where he is standing behind Hitler in the Chancery Garden.